Our Mission Statement is Changing lives one smile at a time. When you choose our office as your dental care provider, you can be assured that we take your decision and trust very seriously and will strive to deliver top quality care in a friendly caring environment. By carefully selecting team members and exposing them to the most up to date treatment methods, we aim to meet that goal during every visit to our office. Our tools are many and are an investment in your care. For instance, we take our x-rays digitally, thus reducing your radiation exposure by 90% while allowing you to see between your teeth on a monitor. We have other pieces of technology that work to raise that quality of your care. However, we know that you are the reason why we are here so please let us know if there is ever anything that could be done to make you feel more comfortable. If there is ever a question you'd like to ask, we'll gladly answer it for you. Your comfort and health is our main concern. We are committed to meeting your needs. If you have any questions or concerns we can assist you with please contact our office. If you wish to schedule an appointment with our office email your contact information, time preferences and availability to our office. Click on the name to view the video of your choice. The office of Brian S. Nylaan, D.D.S. The Facts are. . .
A person can die from a toothache ? Office of Brian S. Nylaan, D.D.S. Digital x-rays are the latest technology, and they reduce radiation 80-90% compared to the already low exposure of traditional dental x-rays. In recent years, laser dentistry has superseded many traditional dentistry practices, making treatments more precise and less painful. Everyone at this office was friendly and helpful. Dr. Brian was extremely impressive and very happy with my switch. He has eliminated my "dentist trust" issues. Everyone is always very kind and friendly. I went to the dentist with the hope of getting a tooth extracted however when asked how another tooth was doing, I replied it was sore and sensitive. So instead of pulling it they were able to remove the decayed matter, and add the temporary/permanent filling until I can get a filling and a crown. I get to save my own tooth, and save myself from a root canal! Your product saved me time, money, pain, and saved my health. Not to mention saving my original TOOTH! You guys have invented a tooth fairy! Well, one that you can see. What fun! Thank you for making the most jaw dropping, heart stopping, eyes popping product for the dental field to offer. 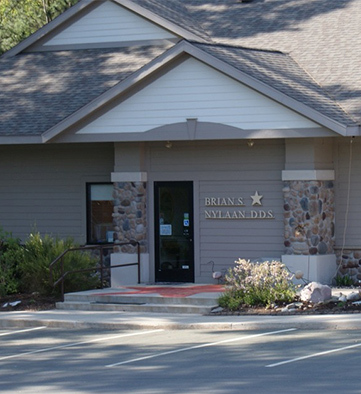 Grand Rapids, Michigan Dentist, Dr. Brian Nylaan is dedicated to cosmetic dentistry such as Exams, Teeth Whitening, Veneers and more.